We haven't seen a flagship device from Verizon and Motorola since the last Droid RAZR was announced nearly a year ago. A case could be made for the RAZR MAXX, announced at CES, but Moto needed something new and splashy to compete with the HTC One X and the Samsung Galaxy S III. The Droid RAZR HD and its big brother want to be that hero device. The Droid RAZR HD boasts a revamped screen. It's 4.7 inches and 720p HD. Should be a nice improvement over the original Droid RAZR's Pentile disaster. The bezel has been shrunk, and though it's not the full-front screen we were hoping for (bezel b. gone! ), it's definitely an improvement, allowing for a larger screen size without increasing the phone's footprint. This is similar to what the Galaxy S III did. The back totally loses the bezel. The laminated Kevlar back that the RAZR line has become synonymous with now extends across the entire back. This should give it a lot of strength while adding very little weight. It's also splash-proof, like the other RAZRs and like all gadgets should be. In its guts there's a dual-core Qualcomm Snapdragon S4 processor clocked at 1.5GHz, and 1GB of RAM. We would have liked to have seen the quad-core S4 Pro, but the dual-core is still a solid performer, giving the One X and the S III (U.S. versions) their very good speeds. It has 16GB of built in storage which is expandable via a micro SD card slot. Naturally The RAZR HD runs on Verizon's uber fast and very wide-spread 4G LTE network, so downloading music, games, browsing the web should be nice and snappy. It comes pre-installed with Chrome for Android, which should boost speeds even more. But if there's one problem that basically all big-screened, LTE-toting phones has had, it's battery life. This puppy packs in a 2,500 mAh battery. 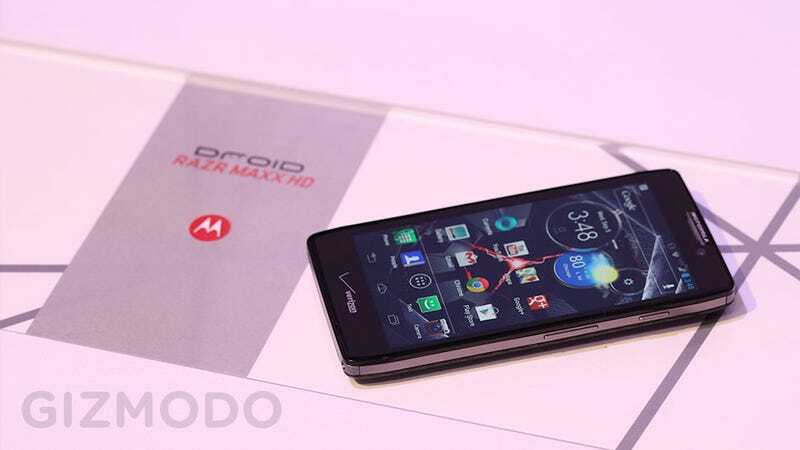 But for those super heavy users, they're also going to have the RAZR MAXX HD. It's basically the RAZR HD, but with the same 3,300 from the original RAZR MAXX. That's more that double the capacity of some other smartphones. In other words, it's going to be all but impossible to run out of battery in the middle of the day, which may be the biggest selling-point of all to some. It also comes with a chunky 32GB of storage and it has a micro SD card slot to expand upon that. Despite all of that, it's still a very thin device (comparable to an iPhone 4S). Both Droid RAZR HDs will be running Android 4.0 (Ice Cream Sandwich) out of the box, with Motorola's custom skin on top of it. This is a disappointment. Months have gone by since Jelly Bean was unveiled, and users are clamoring for those enhancements. Motorola has promised an update to Jelly Bean by the end of the year, but manufacturers simply must get faster on this, and since Motorola is a part of Google, they have even less of an excuse. They come packed with an NFC radio, which means the digital wallet has finally come to Motorola. Verizon isn't blocking Google Wallet anymore, either, and since you can use any of your credit cards, the door is wide open for paying for goods with your phone, in addition to transferring information to other devices. There's also an 8MP camera on the back and a front facing cam for video chatting. It's got a micro HDMI out for instantly streaming video, audio, and games to your home entertainment system, which is handier than you'd expect. All in all, this looks like a very promising piece of hardware. We'll add more details as we get them. We're heading over to the demo tables right now, so check back shortly for our hands-on impressions. Flipping through the OS was snappy. Not quite as fluid as a phone running Jelly Bean, but about as quick as any Ice Cream Sandwich phone we've used. Moto wanted to show that it's serious about bringing Jelly Bean to the new line and had a few devices running a not-quite-finished build. I'm happy to report that flipping through those devices was an extremely smooth experience. Google Now popped up faster than it does on my Galaxy Nexus, thanks (no doubt) to the additional horsepower in its guts. The camera's shutter was quick and it changed modes nice and fast. It's possible that Jelly Bean may be on the phones by the time they launch, but don't hold your breath. The screen looks really good. Very bright and very sharp. It's not quite as beautiful as the screen on the One X, but close. It's equal (almost identical, in fact) to the screen on the Galaxy S III. Good to see Moto finally getting screens right. One troubling thing. In speaking to a Motorola executive they mentioned that Google Wallet isn't not currently available for these devices, and it may not ever be. They could neither confirm nor deny, but it's possible that these phones would use ISIS (a mobile payment system being developed by the major mobile carriers) exclusively. This, obviously, would be a shame. Let's hope that Verizon decided not to block a little friendly competition.